Retailers who saw increases in email conversion rates and revenue per email sent in Q2 2015 are not alone. 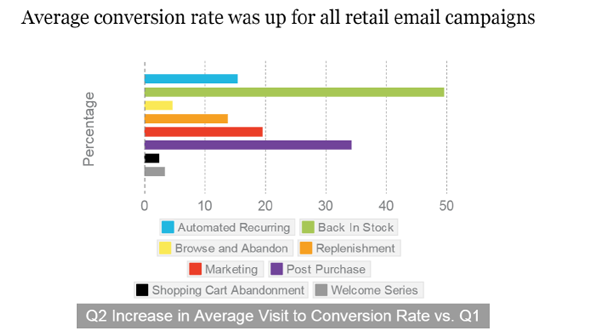 Listrak reports that there were significant increases in average conversion rates for all retail email campaigns on its marketing automation platform in Q2 2012. In fact, back-in-stock emails increased nearly 50 percent, followed by post-purchase emails (enjoying a 35 percent lift). While transactional emails (e.g. purchase confirmation, shipping notifications, etc.) have long been sent (and more recently been capitalized on), back-in-stock emails are more rare but can be very lucrative. Not only are they a second chance to make things right (a brand's reputation with an individual buyer may not take a hit for not having the product they want), but they are also a way to close a conversion that would have otherwise been lost at no fault of the website visitor. There is more good news when it comes to back-in-stock campaigns. 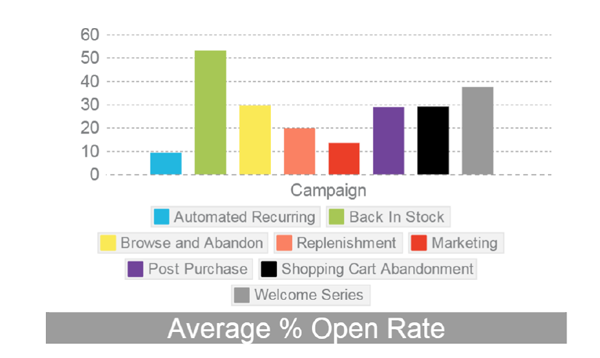 Listrak's Q2 2015 benchmark data shows back-in-stock emails have the highest open rates (about 50 percent), and highest (roughly $7) revenue per email sent compared to other retail campaigns like shopping cart abandonment, welcome series, etc. Retailers will, of course, want to ensure they are managing their inventory in a way that prevents popular products from going out of stock in the first place (Shopvisible offers a popular solution, as des NetSuite in its e-commerce platform), but when all else fails, back-in-stock campaigns are proving to be quite effective. Listrak's back-in-stock automated solution can help retailers deploy sign-up notifications when a product is out of stock, and instantly notify prospective buyers when the product is available to purchase. What's more, Listrak's solution can help retailers identify which products are more popular, helping them to determine how much to order in the future.